After nearly a century of waiting, after multiple starts and stops, planning sessions and economic downturns, New York City’s very own Great White Buffalo is ostensibly 34 months away from its debut. 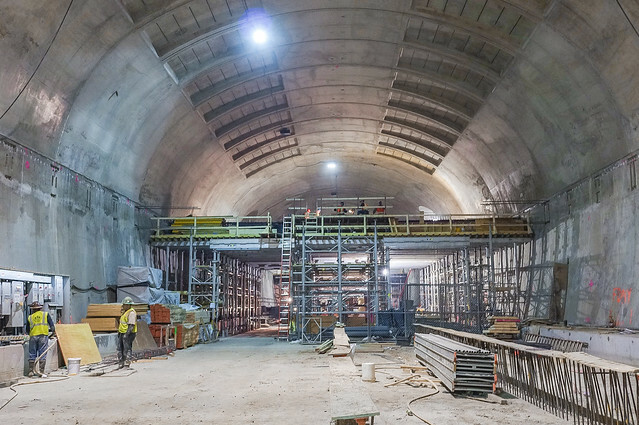 While many long-time Manhattanites won’t believe until they ride a Q train to 96th St., the Second Ave. subway is closer to a reality today than it has been at any time its long and tortured history. If all goes according to plan, revenue service will start in December of 2016, and the real estate industry is starting to notice. In a big story in this week’s issue of Crain’s New York, Joe Anuta went in depth on the impact of the subway and the future of sales and rents along Second Avenue. Although most business owners and residents have spent the past six years complaining about the explosions and dust, the noise and equipment that subway construction had wrought, those who own in the area are starting to reap the benefits while those who rent may draw the short straw. While brokers predicting a 300 percent increase in prices, the subway is making its impact felt. All along Second Avenue on the Upper East Side, the picture is much the same. Property sales and prices have taken off in the past six months, and several new construction projects have been unveiled. In another sign of change, prices of condos along the avenue rose in 2013 for the first time in four years. …The seismic shift in commuting patterns looming in the area has caught the attention of, among others, one of the city’s most prolific landlords. Extell Development Co. first began assembling a series of properties along Third Avenue between East 94th and East 95th streets a decade ago, but only last month filed for permits to potentially tear down several of the buildings to build a tower that could top 150,000 square feet. Also in January, -Manhattan-based Anbau Enterprises filed to demolish three buildings between East 88th and East 89th streets along First Avenue, where it plans to build a SHoP Architects-designed, 150,000-square-foot project it bills as “affordable luxury,” slated for completion in 2016. But there’s a story in between the lines here, and it involves the renters — businesses and residents — who have stuck it out throughout the six or seven years worth of construction. They’re going to escape the construction, but will they become victims a second time when the economic activity generated by the Second Ave. Subway pushes them out? It’s still too early to tell, and life won’t be wine and roses along Second Ave. over the next 34 months. Yet, while we can begin to see what the subway will do for the area, some people will win and some will lose. That story has yet to unfold. Wasn’t the area already upzoned in anticipation of the SAS?? Will you really see that much new development up there? Just a thought. Just because the area was upzoned doesnt mean it was built out. Particular up in the 80s and toward 96th st theres still quite a lot of tenement style buildings on 2nd and 3rd ave that could probably be replaced with giant towers, at least on the avenues. Renters, or at least some of them, were seeing discounts in the area for a while. I’ve mentioned this in the past – when there’s quality rapid transit real estate values increase on average 40% for residential & 50% for commercial acording to the Texas Transportation institute at UT Austin. One’s view of whether renters are now going to become “victims” of rent increases is a function of their view of markets in general. It’s not unreasonable to conclude that because rental properties along 2nd Avenue are now so much more desirable, they are worth more and that the people benefiting from better access should pay for that benefit. Nor is it unreasonable to conclude that they should coninue to pay below market (for comparably situated properties) rents, at least for some extended period of time. I wonder if some politico will use this as an excuse to fight Phase II. It was only yesterday (well actually the late 1960s and early 1970s) when politicians fought subway expansions because they might allow poor people to get to their neighborhood. Now they fight them because they fear affluent people showing up. I live on 94th at 2nd ave and have for the past 8 years. The construction has been MISERABLE. That being said I do enjoy the good deal on rent that i’ve received as a direct result. The garbage, the rats, the sketchy poorly lit sidewalks, have all been the compromises I’ve made. I pay 2400, just increased from 2350, for a very nice 2 bedroom walkup on 94th. It’s about 750 SF with a ton of storage. I can only imagine what they will charge once the construction is done. I can only imagine how expensive the bars and restaurants will be once a subway stop is right outside. I won’t have too though, I’m out in July. The constant fare hikes, sanitation issues, neverending construction, noise, taxes, a city that thinks if you make over 100 grand your somehow rich, i’m over it all. It’s been a good run, but this guy is getting out of dodge. Smart move. NYC is for the rich, the poor, the grifters and students. If you’re none of those four, you can be can owner somewhere else for what you pay renting in NYC. Heck, you can take the PATH to NJ and still work in the city. My major gripe is that with the host of new development there is no option for the middle income earner. I can’t afford a $4,000 a month 2 bedroom, and I ‘make too much’ for the 20% ‘affordable’ units. All that’s being built to any great degree are the luxury high-rise condos. It’s easy to see who some of the BIG winners will be, landlords. Their payday will come in either the form of increased rents or sale to a developer, who will rake in handsome profits as well. Those lucky enough to own their units in the condos and coops already in existence stand to benefit as well.